I few days ago I got a Sony Mavica MVC-FD7 digital camera, with two unusual features: built-in floppy for recording images, and focusing to as close as 1 cm from the lens. Since the camera has a 10X zoom, it’s also possible to focus pretty closely at a moderate zoom, which allows the lens to be a couple of inches from the subject and still fill the frame with the watch dial. But, the problem was lighting. Watches–highly polished ones, anyway–are very reflective, and the crystal is reflective, too. To make things worse, the camera is so close to the watch that it can cast shadows if the lights aren’t adjusted carefully. But, that makes it even harder to get the illumination even and to avoid reflections. The solution I came up with is shown in the first figure. A glass piece, designed to be part of a floor lamp, inverted, with the watch inside. 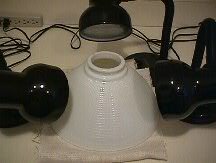 Three ordinary quartz lamps provide illumination. The camera (not shown) pokes through the hole. The result is shown in the second photo. I could have moved the lights just a bit, but the lighting is still nearly perfect. This picture shows lots more detail that I could get just by putting the watch on the bed of a scanner, and it’s nearly as easy to set up. Another way to make a light tend for small objects is to use a large, translucent plastic milk jug. Cut off the bottom, and cut off enough of the top so that you have a big enough hole to shoot through. That’s really a nice shot of the dial–I would not have thought that you could do close-ups like this with a digital camera. I use a “shadow box” made out of opaque white 1/8 inch plastic sheets….I actually made a box with an open top..here is where I mount my camera so that the focus is straight down onto the watch dial. I have two strobe lights on either side which flash when I shoot…but I’m using a 35mm camera with a zoom lens. this gives an even diffused lighting with no hot spots on the watch….the cone shape that you divised would work better in my situation, if my light were raised such that it shines down on the dial rather than from the sides like I have it. Thanks for giving all of us another way to manipulate the lighting…. This would work with a film camera, except that the lens would most likely be too big for normal lighting-fixture globes (or whatever you call them). I tried it with my Nikon N70 with a 24-120mm zoom fitted with an extension tube, but the diameter of the lens is around 75mm, and the hole is only 59mm. My 85mm lens also won’t fit–it’s around 72mm. I suppose it would be possible to raise the watch so the lens can stay entirely outside of the globe. (You would put a UV filter on the lens to avoid scratching it.) I haven’t tried this. If the lens doesn’t touch the globe so as to seal out light coming from above, I imagine you could cover the opening with lightproof cloth. All that fussing complicates the setup, unfortunately. Or, maybe there is another globe with a bigger hole. Of course, using the glass piece I did is only one way. A fabric light tent would also work, either homemade or some commercial item designed for the purpose. If I were in New York, I would have visited B&H to see what they had. Another idea is to use an SLR APS camera with its own lens system (i.e., not shared with a 35mm system), such as a Minota Vectis. I don’t have one of these, but the lenses should have a diameter under 59mm, since they need to cover a smaller negative area. Oh yeah… one other thing. If you use film, you have to worry about color balance, or correct it in the printing, or correct it digitally after you scan. The quartz lamps I used are completely wrong for daylight film. I don’t know about tungsten film. And, I don’t know what filtering on the lights or the lens might be right for correction. Digital still cameras, or video camers, have automatic white balancing (the good ones do, at least), which eliminates the problem. In summary… With a digital camera, you just poke the lens in the hole and shoot. With a film camera, you have a lot more to worry about.